This is set in the same universe as the author's "The New Guys Always Work Overtime" (February 2013 Asimov's) and "There Was No Sound of Thunder" (June 2014 Asimov's), but this story works very well all by itself. 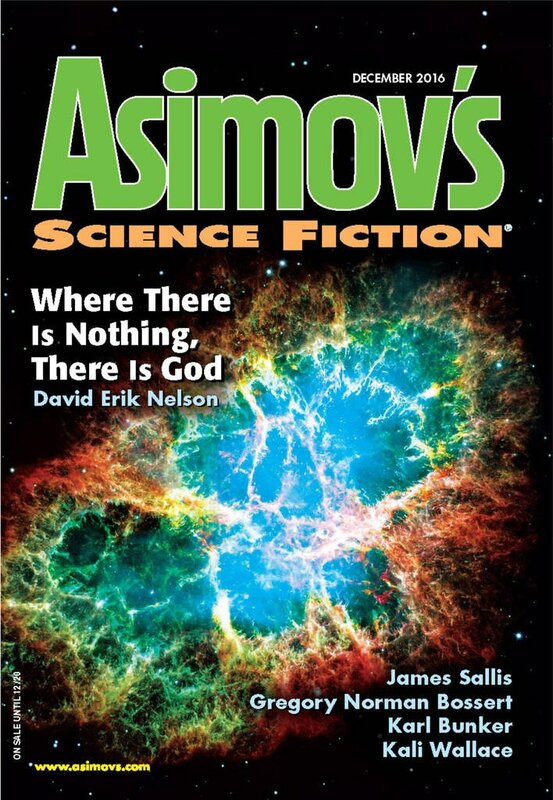 "Where There is Nothing, There is God," by David Erik Nelson [bio] (edited by Sheila Williams), appeared in Asimov's Science Fiction issue 12|16, published on October 27, 2016 by Penny Publications. Pro: The big pleasure of this story is watching all the pieces come together. For example, we're told early that witches get hanged, and later Paul sees his doppelganger hanging from a tree. Or how Paul decides to go barefoot because it's impossible to get the wear-and-tear right on old shoes, but entirely forgets that human feet have wear-and-tear too, with the result that his perfect human feet convince the blacksmith he's an angel. Another pleasure is watching Paul's self-awareness develop, such as when he realizes he really did once have a serious meth habit. Chico is a caricature of a drug lord, but we're led to believe it's something of a put on, so it's entertaining, not offensive. Peggy is a totally amoral academic, who happily devotes her skills to helping the mob, but who really is passionate about her material. Pastor Otis is hilariously earnest about his beliefs--even when he totally converts to the meth gospel. His best moment is when he refers to the hanging of Paul's doppelganger as "all that . . . transpired." The conclusion is well-done. Chico and Peggy get their just desserts. Paul does not get off Scott-free, which is only right, given the pain and suffering he's caused, but it's precisely because he abandoned those two that he ends up in hot water (the Feds wanted the big fish, but Paul was all they got). Con: James, Paul's partner, is little more than a cipher. Having them live in an alternate reality where gay marriage was never legalized seems to serve no purpose in the story. Although Chico definitely gets what's coming to him, it's not as clear that Peggy deserves it. For me this was entertaining but didn't really rise to any heights. I think I was looking for something a bit more involved, with the potential of the time loops, or the artifact retrieval, or the religious element, to be developed more. Quite a unique time travel tale. I thought the details of characterization were well-done too. I'll probably check out the two earlier stories at some point. Discovered they're available as individual Kindle books and can be borrowed from Kindle Unlimited or Kindle Owners Lending Library. I agree with Mark. Entertaining but didn't really rise to any heights. I also found the meth distributing kind of disturbing. It did show the bad effects of using drugs, and the bad guys did get caught in the end, but it sort of clash with the black humour in the story. This didn't sit that well with me. I am just wondering how the DEA knew to be there at the right time. That was not clear. Taylor let the DEA know to be there. His plan was to get Chico arrested when he came back through, not have Paul ditch him in the past. Like Paul and James, I didn't get Taylor's plan. I re-read the part when they were in Chilis. Taylor has his own reason for wanting to stop this - "long story" which was not revealed to the reader. A new character Deke appears with Taylor at Chilis. I have not read other stories set in this universe. There is no mention of Taylor being charged by the DEA, or not (and if not, why not). Just Paul. Something to puzzle over.